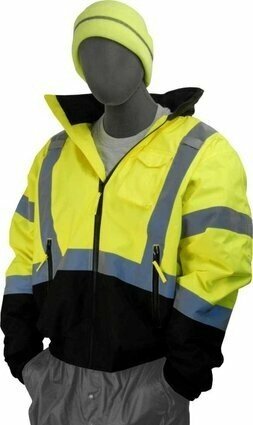 This high visibility yellow jacket is waterproof and made with polyester fibers and a polyurethane coating. This bomber jacket is perfect for keeping you safe, seen and dry. It also has black around the bottom of the jacket as well as around the wrist areas. These are the areas that get the most soiled. It also has nice front pockets to put your hands in to keep them warm. This high visibility bomber jacket meets ANSI / ISEA 107-2010 Class 3 standard. Polyurethane is a very versatile polymer. It is soft yet very abrasion and puncture resistant. Polyester fibers and fabrics extremely strong and durable, resistant to many chemicals, stretch and wrinkle resistant, mildew and abrasion resistant. Polyester is very commonly used in making outdoor and weather resistant clothing. Elastic ribbed waist, wrist and collar make this jacket more comfortable and help keep out the cold. Removable fleece liner keeps the jacket warm. Fully taped seams to ensure waterproofing. Fully detachable hood that can easily be concealed. Inside breast pocket, outside slash pockets and a cell phone pocket. Meets ANSI / ISEA 107- 2010 Class 3 standard.